Have you ever known or met "the perfect mom"? You know, the one who is always well groomed never to be seen with no make-up, whose kids are so well behaved and never throw fits, whose house is spotless, who rises early to read her Bible and exercise, whose husband is perfect as well and never ever has a bad day? Yeah I haven't met her either....in real life anyway. The truth is there is no such thing as perfect. Yet, somehow in our minds we look at most women around us and go "why can't I be more like her?!?! She's got it all together and I am just a mess!!". But the problem is that we only see a glimpse of each others lives. We don't live with each other 24/7 to see the good, bad and the ugly. Just last week I had a "mommy melt down" moment. I had these moments quite often when our kids were babies and toddlers so I was surprised to find myself in one again since our kids are much easier these days. I was standing over the stove cooking dinner, my kids were driving me crazy and I remember thinking "I am SOOOO going to Target when Matt gets home! I'm out of here!" (Side note: Matt and I now joke about "I'm going to Target" because I used to use that as my out when the kids were younger). As soon as that thought came into my brain I heard the Lord say "why do you have to wait until your husband gets home to use the authority I have given you and usher peace back into your home? Do it now." So, I begrudgingly went to the living room and turned christian dance music up HIGH. I'm sure our neighbors thought I was crazy. But guess what...IT WORKED. 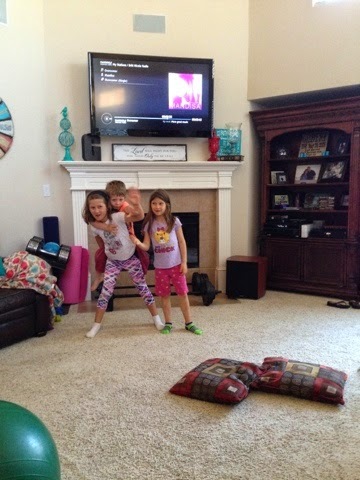 My kids stopped fighting and pouting and we all had a dance party in the living room. When my husband got home that night I ditched my "going to Target" plans and we all had a peaceful and joy filled night of laughs, playing and a family dinner. So you aren't perfect? Neither am I and it's okay. God never asked us to be perfect but He did ask us to allow Him into every area of our lives. As a mom and wife we have been given a unique authority over the atmosphere of our home and all we have to do is listen to God and let Him show us how to usher His presence in when things get a little crazy. :) Sometimes it will take a special trip to Target(or wherever your happy place is) and that is okay too. Just ask him, he cares! Very encouraging, I like to do that when my toddler is going crazy, and she loves this song too, actually!